There are a lot of condiments and foods that I love and Tom won’t come anywhere near them. One of the items on that list is cold pasta salad. He will eat cooked pasta. He will eat veggies pureed into a sauce, but he will not eat cold veggies (or even pepperoni) with cold pasta and a dressing. Cold pasta salads are great in the summer. Aside from cooking the noodles, you don’t need to turn on the stove or oven, making your house any hotter than it needs to be. Plus, they last for nearly a week when stored in the fridge. Talk about an easy side dish! Anyway, since I know that my family likes cold pasta salads and they were coming up to visit a few weekends ago, I immediately added one to my menu. Ah, sweet cold perfection! 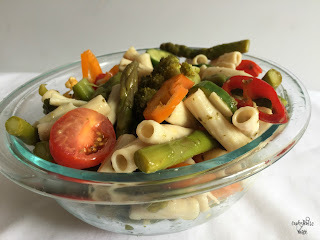 I love the crispness of the veggies, the flavor of the dressing and who can go wrong with pasta? 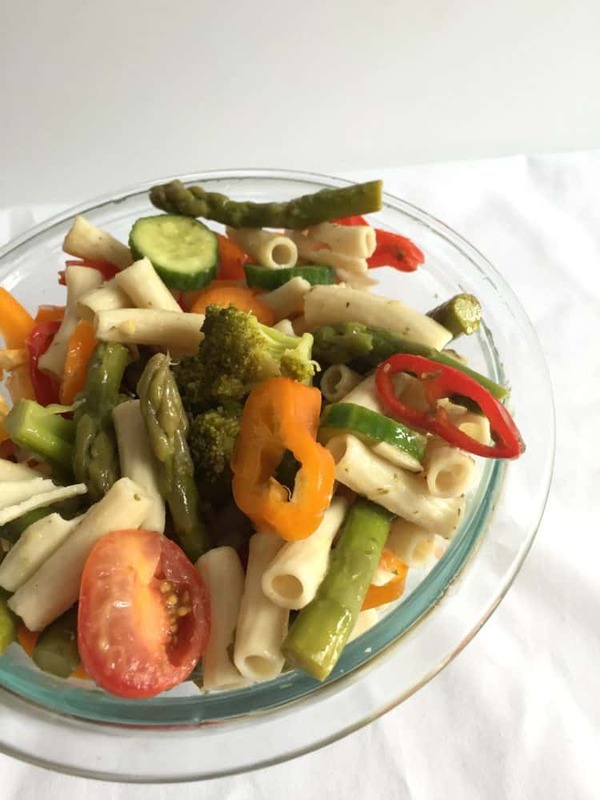 A cold pasta salad dish full of fresh veggies and topped with Italian dressing. 1. Bring a large pot of salted water to a boil. Add pasta and cook according to package directions for al dente. Drain, reserving 1 cup of the cooking liquid. Rinse pasta and set aside. 2. Return the reserved cooking liquid back to the pot over medium heat until simmering. Add the asparagus and broccoli and cook for 2-3 minutes or until just tender crisp. 3. Meanwhile, add cold water and ice to a medium bowl. Transfer the broccoli and asparagus to the bowl to stop from cooking. 4. In a large bowl, add the cooked pasta, asparagus, broccoli and other raw veggies. Toss to combine. 5. Pour dressing on top. Sprinkle with fresh herbs and toss to combine. Season to taste with salt and pepper. This recipe will keep in the the fridge for up to 5 days. I made two versions of this dish, first one that used tri-color rotini pasta and standard Italian dressing for when my family came to visit. There were no leftovers, which was okay because I wanted to make a version approved for the Fast Metabolism Diet. 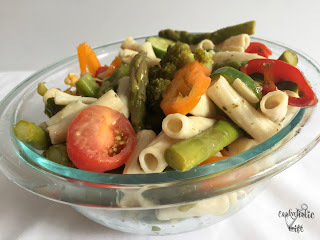 FMD Changes: use brown rice pasta, replace asparagus with another P1 compliant veggies and use an oil-free dressing such as Jacob’s Raw, Simply Girl or one from the books. This recipe will make 2 servings for 20 pounds or less. Protein will need to be added for dinner, protein and fruit for lunch.